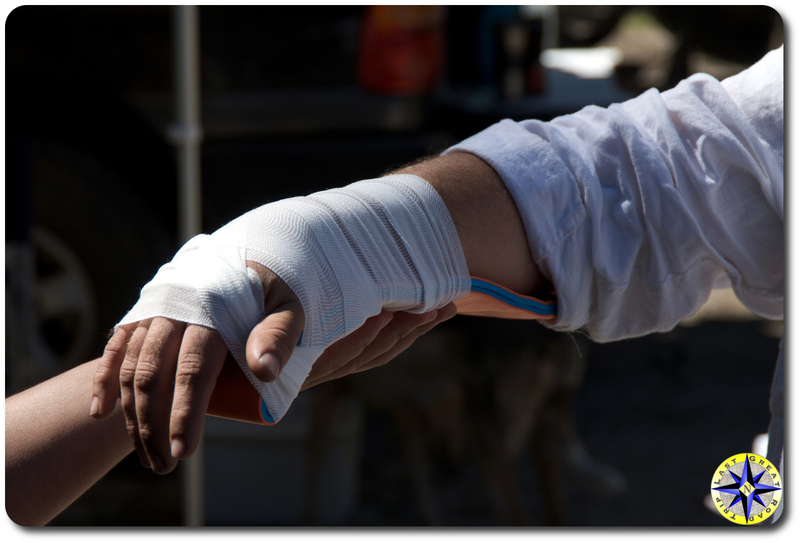 We’ve always taken wilderness first aid preparedness seriously as a part of our off-road adventures but it was not until that fateful day in Moab that our training got put into use. 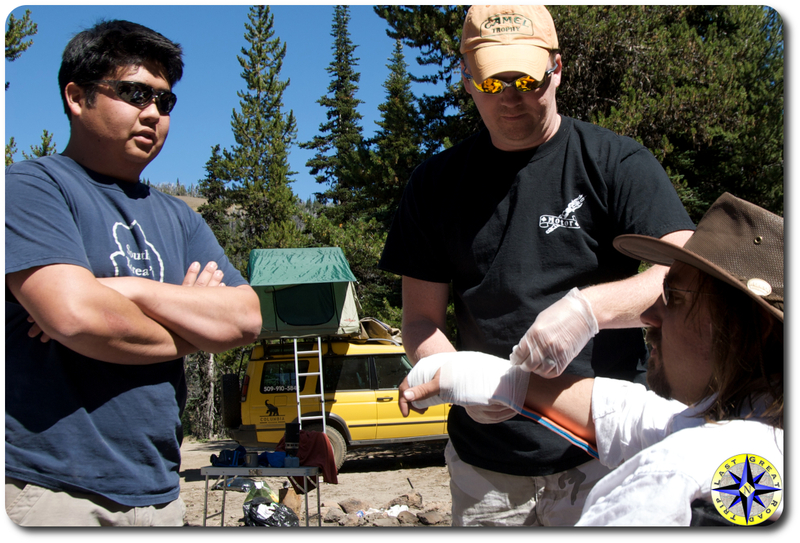 There are two requirements to help produce a successful outcome in a wilderness first aid situation. First you and preferably everyone in the group, need to have the knowledge on how to treat victims for a wide range of accidents and (b) you need to have the medical resources to treat the problem. When you get off the beaten path by bike, hiking, horseback or 4×4 it is important that you have a solid understanding of how to treat accidents of all kinds. This includes: second or third degree burns, deep cuts, sprains, broken bones, heat exhaustion, hypothermia, animal bites and more. In order to learn how to treat accident victims, start by taking a basic first aid and CPR class taught through the Red Cross, the American Heart Association, local community college, outdoor club or private company. These courses will provide you with a basic understanding of first aid and how to work with victims in an emergency situation. Red Cross’ Wilderness and Remote First Aid Pocket Guide. 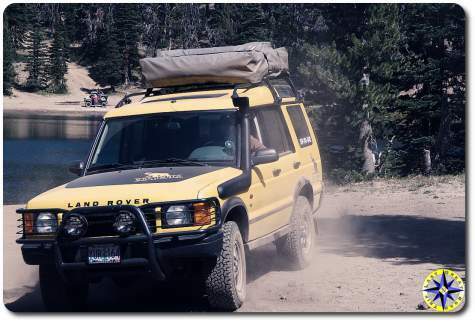 If you are the leader of an off-road adventure you have an increased level of responsibility and leadership role as medical support for the group. You may want to take a more intense wilderness first aid training course or assign the medic role to one of the other member of the group who has additional training. In extreme off-road adventures where first aid is the only aid you can expect, you may want a paramedic, ER nurse or doctor to join the team. When it comes to medical supplies we recommend braking it down into two categories, personal first aid kit and group trauma pack. The group trauma pack should contain a wide list of supplies such as: scalpels, scissors, tweezers, forceps, nitrile gloves, splints, burn creams, eye wash, ice packs, heat packs, space blanket, ACE bandages, blood clotter, antibiotic ointments, antiseptic creams, alcohol swabs, hydrogen peroxide, aspirin, non-aspirin pain relievers, mole skin, butterfly wound closures, large sterile gauze pads, triangle bandages, non-stick pads, sterile gauze rolls, adhesive tape and lots of various sized band-aids and sterile gauze pads. 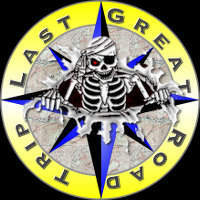 The group should carry a trauma pack with enough supplies to support several team members being involved in an accident. Each person in the group should carry a personal first aid kit that is kept with them. The individual first aid kits are a combination of simple basics as well as personalized medical needs. At a minimum we recommend each personal kit include: antacid tablets, Pepto-Bismol tablets, aspirin/non-aspirin, antihistamine, insect sting relief, insect repellant, lip balm, sunblock, Moleskin, antiseptic cream, large and medium sized band-aids as well as several 3×3 sterile gauze pads, adhesive tape and tweezers. Every individual should personalize their kit to support any prescriptions or medical needs they may have such as allergy meds, asthma inhalers, insulin kit or EpiPen. More than likely you’ll never pull out the group trauma pack. Most little scraps, blisters and upset stomachaches can be handled by the individual using their personal first aid kit. More serious needs will utilize both the personal first aid kits, the group trauma pack and other do-dads such as duct tape, Velcro straps, leatherman tools, blankets, water, hi-lift jack bars, hoses, what ever it takes, in order to bring all available resources to bare . 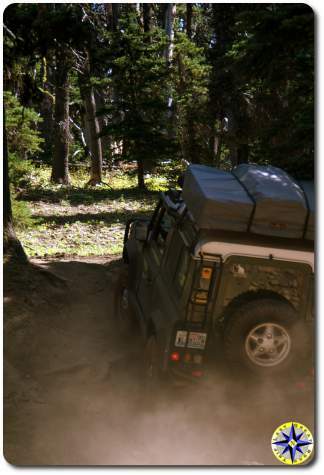 The last piece of the first aid preparedness puzzle on an off-road adventure is to have a pre-departure check-in to assess everyone’s skills, discuss any team members’ special medical needs and drug allergies, verify individual kits and ensure everyone knows where the group trauma pack is kept as well as what protocol to follow in case of an accident. 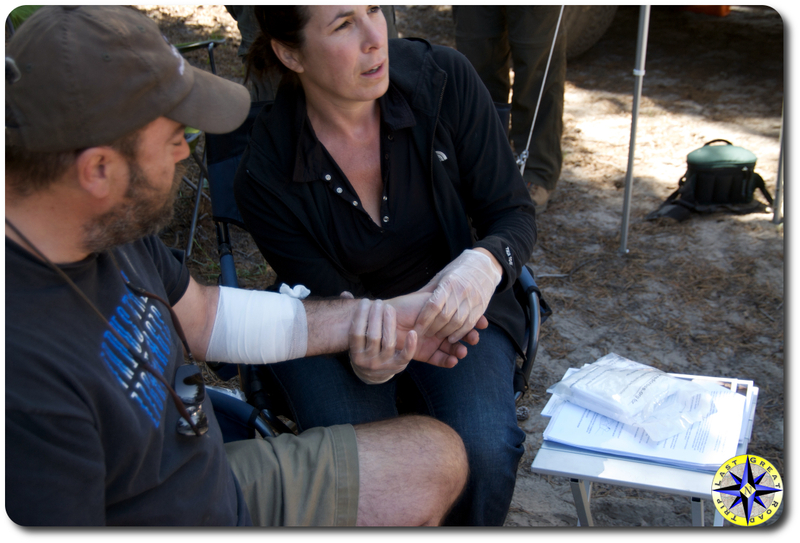 Most off-road adventures never encounter a serious injury but without a doubt you have to be prepared to provide medical aid in locations where first aid may be the only aid for a long time.